Chocolate mint extract is a delicious way to harness the delightful tastes of chocolate and mint and preserve them in a form that can blend easily with so many dishes, especially desserts. 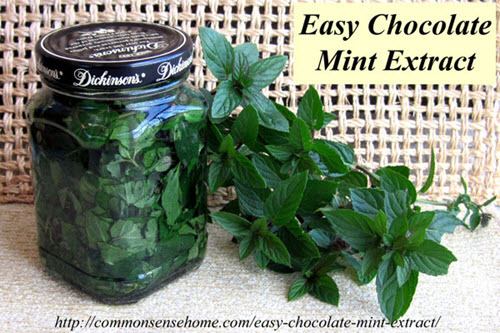 The tastes of the chocolate mint plant are extracted in the same manner as vanilla extract and can be used as easily. One nice thing about the flavor of the chocolate mint plant is that, if you don’t have access to the plant, you can recreate the same flavor by using peppermint leaves and a tablespoon of cacao nibs. The tutorial details the rest of the process and is wonderfully easy considering all of the tasty ways you can use the chocolate mint extract.